Students will utilize conservation of mass-energy to explain how the annihilating collision of a proton and an anti-proton can produce a particle with six times the mass of either. Students will explore sub-atomic physics by researching and arguing for or against funding of particle collider research. Students will self-select into groups of three or four. Students will read the background information on the topic and create a tentative argument in favor of or opposed to continued particle collider research funding. Students will develop supporting evidence (minimum three strong statements) for their argument. Students will choose and research a sub-atomic particle (each group must choose a unique particle) or a research activity at CERN or FermiLab. Students will create a poster summarizing their stance, supporting evidence, and particle research, which will be presented in a walk-around poster session. Posters may be 8.5"x11" up to 24"x32". Posters should be neat, legible, professional, and attractive. Name of all group members on back. A large, clear, easy-to-read title. Position statement on particle collider research funding. Bullet list of three supporting statements. Organized summary of particle or experiment research and potential benefits, with three cited sources. Students will individually submit final written arguments on the APlusPhysics Community Forums, and constructively respond to at least one other student. Each year our government spends hundreds of millions of tax dollars funding particle accelerator research at a variety of facilities, including Fermi National Laboratory in Chicago, Ill., and CERN's international Large Hadron Collider (LHC) facility in Switzerland and France. Controversy abounds in spending levels for such research... the CERN LHC itself cost approximately $9 Billion (funding comes from an international consortium of countries). Following some research, you are to create an argument either in favor of continued funding or opposed to continued funding of such efforts. This argument must have a minimum of three strong supporting statements. Use the resources below to begin exploring the issues and potential benefits of particle collider research. One strong supporting statement. Two strong supporting statements. Three strong supporting statements. Four strong supporting statements. Poster created. Poster contains most required components. Professional and attractive poster with most required components. Professional and attractive poster with all required components. Statement posted. Statement posted and includes all supporting evidence. Statement posted and includes all supporting evidence clearly stated. Comment added to another's post. Position statement and all supporting evidence clearly stated, constructive comment on another's post shows thought and insight. Superficial restatement of research. Organized summary of research on particle or experiment includes explanation of research, potential benefits. Organized summary of research on particle or experiment includes explanation of research, potential benefits. Multiple sources cited. Organized summary of research on particle or experiment includes explanation of research, potential benefits, and tie-in to course content. Multiple sources cited. One of three questions answered correctly. Two of three questions answered correctly. All questions answered correctly. All questions answered correctly in AFSA format. For years, theoretical physicists have been refining a mathematical method called lattice quantum chromodynamics to enable them to predict the masses of particles consisting of various combinations of quarks and antiquarks. They recently used the theory to calculate the mass of the rare Bc particle, consisting of a charm quark and a bottom antiquark. 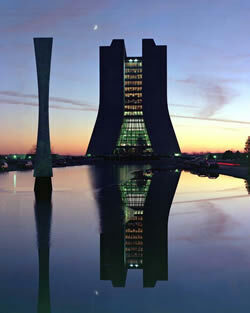 The predicted mass of the Bc particle was about six times the mass of a proton. 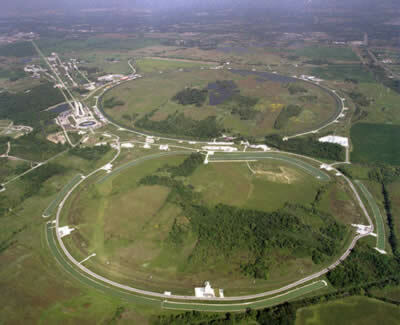 Shortly after the prediction was made, physicists working at the Fermi National Accelerator Laboratory, Fermilab, were able to measure the mass of the Bc particle experimentally and found it to agree with the theoretical prediction to within a few tenths of a percent. In the experiment, the physicists sent beams of protons and antiprotons moving at 99.999% the speed of light in opposite directions around a ring 1.0 kilometer in radius. The protons and antiprotons were kept in their circular paths by powerful electromagnets. When the protons and antiprotons collided, their energy produced numerous new particles, including the elusive Bc. These results indicate that lattice quantum chromodynamics is a powerful tool not only for confirming the masses of existing particles, but also for predicting the masses of particles that have yet to be discovered in the laboratory. Identify the class of matter to which the Bc particle belongs. Determine both the sign and the magnitude of the charge of the Bc particle in elementary charges. Sampson, Victor, and Jonathan Grooms. "Generate an Argument: An Instructional Model." The Science Teacher 77.5 (2010): 32-37. Print.